I now embark on a journey into the minds of my favorite heroes. They’re significantly more difficult to define than villains, because villains wreak havoc and have daddy issues and yadda yadda yadda. Heroes, on the other hand, come in many varieties. This was my criticism of numerous lists of heroes in recent years. Indiana Jones is an archaeologist, not a hero. No. 5. Samwise Gamgee from The Lord of the Rings trilogy. An odd choice you say? Yes, there are certainly people who fight more in the films, and Frodo certainly goes through more emotional turmoil, but you know what? Sam sacrifices more than anybody, because whereas the adventure was thrust upon the other hobbits (who are also heroic), Sam could’ve stayed home. But he didn’t, because he was loyal. He went to Hell and back out of loyalty, when he could’ve been sitting in the Shire enjoying some taters and a nice coney stew. Aragorn is the main hero of the piece, but he was a mercenary before he was king. He has no fear of battle. And Legolas is pretty much an assassin, so he not only has no fear of battle, he enjoys it. This is why the most important scene in the trilogy is after Aragorn is crowned and he tells the hobbits, “my friends, you bow to no one.” The best heroes are the ones who are quite average, but who manage to do heroic things anyway. I chose Sam because he represents a lot of unsung heroes within film. He stays true even as his whole world dissolves around him, and that’s a powerful thing. I’m going to start sounding like those hippies I hate on all the time, but he shows us that true unconditional love (not in the romantic sense, for all of you fetishists out there) is more powerful than any Ring of Power could be (okay that was venturing into some seriously cheesy territory). I mean it though, and I’m a big softy at heart. If you consider it, Sam catches a lot of crap from people throughout the movies. When everybody is getting gifts from the elves even the Laurel and Hardy of the trilogy get daggers. Know what Sam got? Rope. Freaking rope. Not a new bow, not a sweet weapon, not a glowy light thingy that repels giant spiders (oh how this must sound to someone who hasn’t watched the movies). And when he asked if he could get a dagger, Galadriel pretty much looked at him as if to say: “what was your name again?” But did Sam throw a fit? Did Sam turn to the dark side? No, he did not. He sat and took the crap. And I suppose the rope came in handy for the first 12 minutes of the second movie or so, if that’s any consolation. Plus as you may recall, the main reason he ended up on the journey at all was that he was far too attentive as a gardener. He was trying to make Mr. Frodo’s garden look all presentable by putting in some extra hours, free of charge. And how is he rewarded? Some wizard dude tells him he needs to embark on an epic quest into the pit of Hell to destroy some piece of jewelry that his boss’s uncle was too needy to destroy and that his boss is too wimpy to destroy alone. Did anyone ever think that maybe poor Sam just wanted to go out with the chick from the pub and grow some tomatoes for the rest of his life? But that’s the way true heroism works. I forget which graphic novel I read it in, but the man doing the introduction said that “villains want to be heroes and as they strive for it they become corrupted, real heroes have responsibility thrust upon them.” I think there’s a lot of truth in that, and if you look back on my list of villains it’s pretty apparent that they all want to be saviors in one way or another. But not Sam, I think you’ll find that except for his distrust and dislike of Gollum he’s a pretty easygoing guy (especially considering all the nonsense he gets put through). This is what makes him the most recognizable and realistic hero of my entire list. Which means you don’t have to read the other 4, lucky you. Seriously though, having the ability to care about your friends enough to put up with crap and also do anything to help them out, even if they hate you for it, is some real heroism. This trend continues into the third film, especially in some of the added scenes for the extended cut. And it leads you to wonder: would he be this positive if his life had always been easy? Probably not. 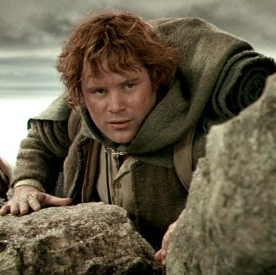 Sam shows us that it is through hardship, especially the kind that nothing but the cruelty and unfairness of life brought upon you, can we start to be better. He appreciates the little things because the little things are all he has. He’s literally the “everyman.” So even though every guy dreams of being Aragorn, the ruggedly handsome action hero who becomes king and marries the hot elf, nobody really gets that kind of opportunity. We all dream of being the people who will take up the rest of my list, but really there’s no chance of that. But I’d say that if we can have the courage to take life’s pitfalls with a smile, stand by our friends at all times, and then lead a simple life growing tomatoes with the girl from the pub, then that’s pretty good. So our buddy Sammy might be hanging around the bottom of the list, but I think that’s exactly the way he’d want it. Well that’s part one of my 5 favorite heroes, it took me longer to write than any other blog entry if you get right down to it. So I hope you enjoyed it, especially if you like warm and fuzzy feelings. Because at least 3 of the other 4 aren’t too cheery. In fact, contrary to my opening paragraph, they’re not particularly “heroic” in the classic sense. They’re messed up people trying to do the best they can. That’s what makes them interesting, but re-read the previous few paragraphs if you’re looking for a role model. Because if you actually model yourself after literally anything that these guys do, you’ll probably go to jail.